The Fifteenth Judicial District Commission on Judicial Performance unanimously (10-0) recommends that Judge Larry Eugene Stutler BE RETAINED. Judge Stutler received a B.A. from the University of Denver in 1973 and his law degree from the University of Colorado in 1976. 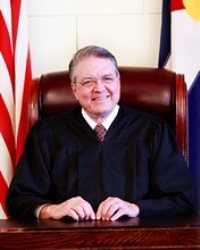 Judge Stutler has been the Prowers County Court Judge since November 1, 1995. He is also currently the Municipal Judge for the City of Lamar. He makes himself available to other judges, especially those new to the bench, as a mentor when needed. The Commission voted on its recommendation after observing Judge Stutler in the courtroom, reviewing opinions he authored, conducting a personal interview, and reading the results of the surveys sent out to people who appeared in his court. On the question of whether or not Judge Stutler should be retained, 100% of attorneys recommended retention. Of the non-attorneys, 87% recommended retention, 9% recommended not to retain and 3% made no recommendation. Judge Stutler’s overall combined average score in the 2014 Judicial Performance Survey was 3.67 out of a possible 4.0 for 2010-2013, 3.74 out of 4.0 for 2013 alone. Survey comments from attorneys and non-attorneys indicate his demeanor, legal knowledge, diligence, fairness and ability to communicate are all highly regarded.